Delicious – Emily’s True Love Premium Edition, a wonderful Time Management Games. 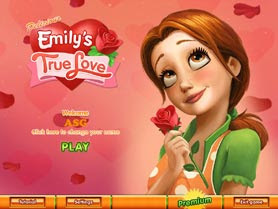 This games tells love story of emily that manage restaurant.Shades of promise appear when she receives a rose, but she is too shy to act on it. Then one day an old love letter from a summer romance arrives that turns Emily’s world upside down. Will she find her true love? Find out as you follow Emily on this game -new romantic journey. Work your way through Emily’s Place and all the way to Paris helping customers and learning more about the one that got away. Complete all-new wonderful games, slink your way through awkward situations, and meet fantastic new friends around the world. With exhilarating tasks, endearing surprises, rewarding trophies, and fabulous upgrades, Delicious – Emily’s True Love is very good game to be play by you!